What is the future of humankind? Yuval Noah Harari attempts to answer these questions and provides, as indicated in the sub-title, a possible future based on human history. It is a book about an apocalyptic future in which technology plays a major role. Harari is a history professor at the Hebrew University of Jerusalem, whose widely-acclaimed 2014 book “Sapiens: A Brief History of Humankind” plotted the history of human activity. 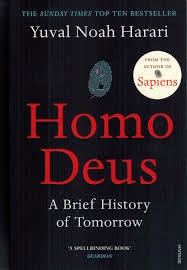 “Homo Deus” (literal translation to Latin, man-god) is thus a sequel, if you like, to “Sapiens” in charting what the future will hold. Harari is quick to qualify his hypotheses, that should this book enlightens and thus changes the future away from the trajectory which he predicts then he has done his job. Ominous, doesn’t it? It is Harari’s proposition that for this century, humans’ search for meaning will be directed at playing God – to create new life forms and as intelligent designers of our own Utopia – that is to achieve bliss, immortality and divinity. This is contrasted with historical human activity geared towards merely meeting our basic needs of overcoming sickness, hunger and war. “The entire contract [between humans and modernity] can be summarised in a single phrase: humans agree to give up meaning in exchange for power.” And for this, there will be a price to pay. Against the backdrop of rapid technological advancement, Harari suggests we will live in the age of data-ism, in which our faith in data and algorithms will be sacrosanct, as our faith in God was. And with the accelerating rise of technology and machines, long-term future is not imaginable nor predictable. Thus, his initial qualification. The book does not envisage the end of humanity, rather humanity as we know it. It perhaps serves as a warning against mindless and unconscious reliance on technology and data, and it begs the question: which would you choose – consciousness or intelligence? The rise of AI and technology will certainly transform the world, but it does not mandate a single deterministic outcome. All the scenarios outlined in this book should be understood as possibilities rather than prophecies. If you don’t like some of these possibilities you are welcome to think and behave in new ways that will prevent these particular possibilities from materialising. Yes, especially to readers interested in alternate or different perspectives, and willing to explore diverse conceptions of human civilisation.